PEVELY, MO – August 4, 2018 – Logan Schuchart passed Daryn Pittman on Lap 15 and never looked back to claim the 2018 Ironman 55 at Federated Auto Parts Raceway at I-55, worth $20,000. The final 42 laps went non-stop as Schuchart negotiated lap traffic to claim his first World of Outlaws Craftsman Sprint Car Series Feature of 2018. Kasey Kahne Racing teammates Brad Sweet and Daryn Pittman completed the podium. Schuchart won the Sears Craftsman Dash, earning the pole for the 55-Lap Feature alongside Daryn Pittman. Pittman, who won at Pevely in April, got the jump on the initial start to lead the opening circuit. Pittman reached lapped traffic by Lap 5 around the tight-quartered bullring with Schuchart close in tow. Schuchart pulled even with the 2013 Outlaw Champion on Lap 9, but couldn’t make the pass. Pittman and Schuchart were side-by-side for the better part of the next four laps before the lone caution of the event flew with 13 complete for Aaron Reutzel. Pittman maintained control on the restart, but Schuchart remained persistent and took command of the field on Lap 15 through turn two. Pittman tried to get back by the No.1S, but ended up losing second to his teammate Brad Sweet in the process. Following Reutzel’s caution, the remaining 42 laps went non-stop as the Ironman 55 lived up to its name as the most grueling event on the World of Outlaws schedule. Schuchart navigated lapped traffic like a veteran. As rubber began to set in around the I-55 Raceway in the closing laps, Schuchart made the decision to follow lapped traffic and force Sweet and Pittman to find a way around him. “I tried to hold my line as the rubber set in and force someone to go around me,” Schuchart said in reference to the closing laps. Sweet and Pittman closed in on Schuchart, but could do nothing but watch the Shark Racing No.1S capture his first win of the season. Both Sweet and Pittman were within a second of Schuchart at the checkered flag. “Man, this is awesome. I feel like we have the best team we’ve ever had. This is Drydene Performance’s first Outlaw win and we can’t thank them enough for their support,” an exhausted, but elated, Schuchart said in Victory Lane. “This is one of the big ones – Ironman 55. It’s tough, it wears you out. It’s awesome to get one of these wins and a big one at that,” Schuchart added. Sweet settled for second but was pleased with his car speed. 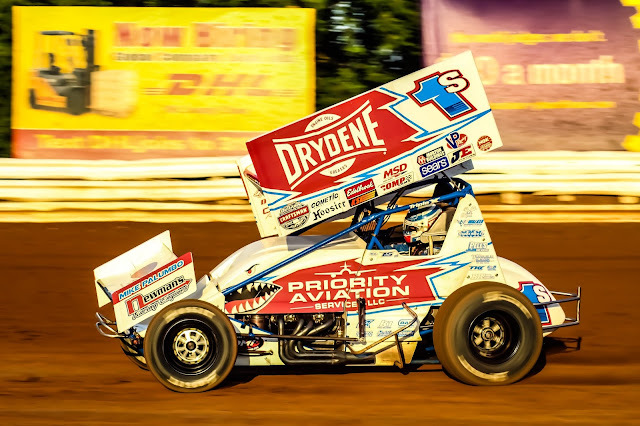 “I was biding my time, waiting to see if he was going to make a mistake and he never gave us a real good shot to get by him, he set a really good pace up top,” Sweet said before expressing his excitement to get to Knoxville for the Nationals. Pittman led early and finished on the podium with his KKR teammate. “My car was getting better as the race went on, I’m a little frustrated with myself,” Pittman said. “I wasn’t quite quick enough on top on that restart and then I broke my momentum and Brad got by me. I’m really happy with our car right now, we’ll take third and go to Knoxville and try and improve there,” Pittman added in good spirits. James McFadden came from 11th to finish fourth with Schuchart’s teammate Jacob Allen completing the top five. Brent Marks earned KSE Hard Charger honors surging from 22nd to ninth. It was announced that tonight was the largest crowd in Ironman 55 history and the World of Outlaws will return once again to Pevely on August 2nd and 3rd of 2019. Next up for The Greatest Show on Dirt is a trip to the Sprint Car Capitol of the World for the biggest race of the year – the Knoxville Nationals, which will pay $150,000 to the winner. After Nationals, the Outlaws will begin a trek to the West Coast starting in North and South Dakota.